It was a nail biter today. Gene "Mobile East" Wooster was holding the lead with 2 releases from day one; he just needed one bite to put away the tourney. Henry "Big Dipper" Frazier landed a tarpon about 9 am this morning, added to the tarpon he caught on Saturday, also the first fish of the tournament, this second tarpon was enough to give him the lead. To seal the deal, Henry added a third tarpon to his tally. He walked away with 1st place in the tournament and both calcuttas, for the professionals and the calcutta for those who had not before caught a tarpon in the tournament, totaling better than $6k. and was happy to get it. Wow, was it hot out there. Yes, I'm still retired and no, I'm not fishing in the tournament, but I will be out there, getting out before the crowd, leaving the dock at 5 am. I will also be the boat that looks like a porcupine, fishing 8 rods wheras the tournament anglers will have only 4. I support the tournament, full page ad, and the Oriental Rotary Club. Best of luck to all the anglers. Report from today, I saw a few and caught none......but I've got a feeling that I'm going to get mine tomorrow. After the half day that they paid for, I forced the guys to go tarpon fishing for a couple of hours, we saw a few pods of fish and had a shot at the big drum on top, but no bites. Here's a pic from Capt. 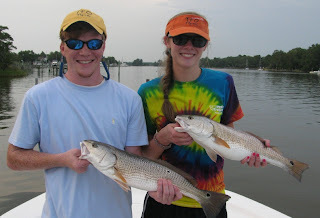 Gary and a recent double header on a skiff trip. We caught a tarpon, pulled the hook on a tarpon and jumped one off. The two that we lost, I set the hook. The one we caught, was on a rod that Brian lent me this morning and hooked by Wilbur. I was ribbing Brian a bit, telling him that all his big drum didn't add up to a tarpon......so he caught one right at the end of the day as both of us were getting in the lines. Many thanks to Aunt Bev Perdue who announced today that PCS would NOT be coming to Morehead City and building a molten sulfur processing and shipping facility. I did manage to see a few today, very few, but after 4 hours of soaking and changing bait and battling sting rays.....no bites. Looked for a few hours, then gave it up. 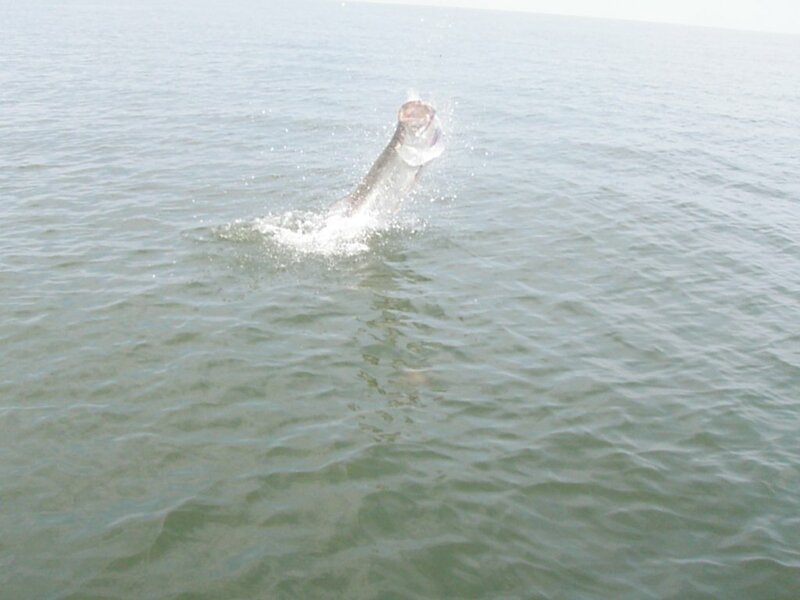 On the way home, we were running wide open and a great big tarpon rolled up in our path. Pulled it back, put out the anchor, bait, etc........and never saw him again. Taunted. Thanks for those checking in with me and my dad. He is 100% A OK FINE, but was in a car accident that made the news. First a special thanks to Dan and Donald at Custom Marine Fabrication in New Bern. After 3500 hours of hard beating, I developed a stress crack in the tower they built for me. In less than 3 hours, they've got me back on the water. Looks like the winds are laying down, I'll be out there tomorrow with the Dream Team and Madam Commissioner. "We went out for the first field day of the season last week and look what we got on our first set... 2.5 m mature male bull shark! Caught him on a piece of barracuda on a drumline. Right around Turnagain. I implanted a transmitter and we were able to track him for about three hours. Very exciting!." 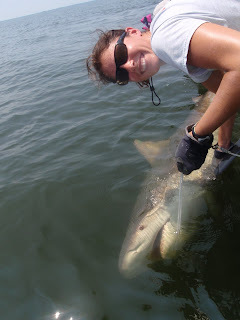 Meagan would appreciate any information on recent bull shark sitings in the Neuse River/western Pamlico Sound. Shoot us an e mail and we'll put you guys in touch. We caught some Flounder on the back side of raccoon out of the wind and then this brut. He was in 3 foot of water on the back-side of Raccoon Island and hit a 4 inch Gulp Bait. Tuck fought him with a 2000 series Okuna Reel and 12lb line on a medium action rod. He did a great job fighting this fish gently and boated him and released him safely. The fish revived nicely and swam away with no signs of stress. As a bonus, the fished was tagged and we look forward to getting the data back soon. After 3500 hours I finally pounded one of the legs off the tower today.......and I saw no tarpon. Did catch a yearling drum. Capt. Ray had a good afternoon with them yesterday, catching "two handfuls" of drum, including several small enough for dinner. Winter in Argentina to 100+ degrees on the Neuse, what a change? Nacho and I got out for an amazing afternoon of shooting Rosey Bills before I left San Javier, but I was still a little late getting to the plane and had to stay the night with Nacho and his friends in Buenos Aires.......oh well.....I slept really good on the plane. Got back yesterday at noon, picked up fresh bait, loaded the boat and got home for some quality time with my smoking hot wife, left the dock at 7 am today, deployed the anchor 10 times in between just looking for about 3 hours. I saw nothing. Did catch 7 really nice sting rays. Back after them tomorrow. They're not thick yet, but good to see them around. 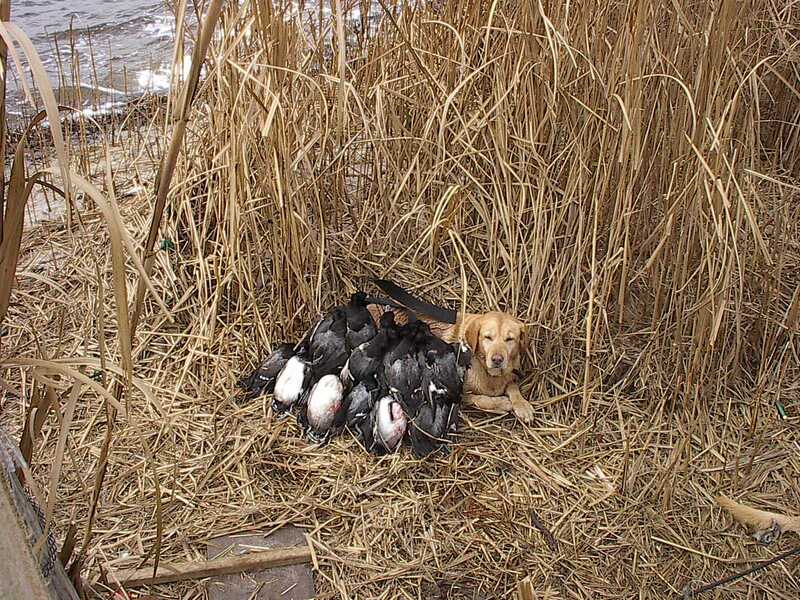 Just a couple more duck hunts for me and I'll be heading home. Now it really is like winter. It's been great, but I'm ready to see the boss lady and get back out on the water. 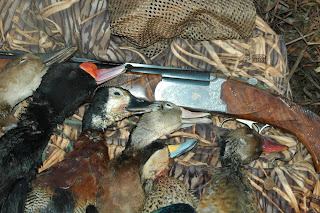 Plenty of ducks down here, no more anacondas, still looking.....but the cool weather has them holed up somewhere. Meanwhile at hom, Capt. Brian......the rock star....... got some silver on Saturday and Capt. Greg already got a big "old drum". Did I tell you that I caught an anaconda? Yeah man, I looked like Marlin Perkins on Mutual of Omaha's Wild Kingdom. I was looking for a duck the other day and there it was trying to crawl up on a tree and get some sun. I wrestled it down to the ground and stuffed into a decoy bag. Jimmy shouldn't have slept-in that morning. He got a surprise in his bed when we got back to the lodge. Can you believe I've been working? Can't hunt every day. The guys are out there getting it done with the ducks and I've been working on the newsletter. Keep an eye out for it in the next week or so. Hope to get to take some pics tomorrow. 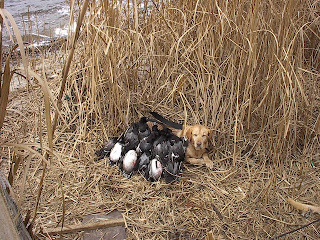 17 years ago, when I started Down East Guide Service, my partner was a yellow lab named Ruby. Many of you may have had the pleasure to unt with her. She passed away a couple of days ago. Here is a pic of some of the work that she did in her younger days. Anyone that would like to make a contribution in her name, please check out www.reddogfarm.com. They are good people and do good work. 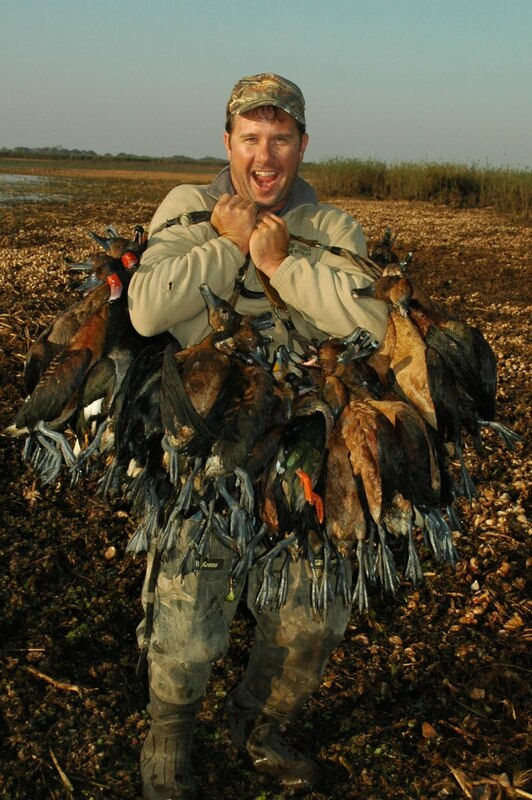 These aren't bird boys, they are bird men, toting out 30+ birds each and the decoys, guns, stools, shells, drinks etc. Where do all these ducks go? There are plenty of people that want them. Most of these shots were of folks who live along the river and the "islands" of the delta where they take care of that great Argentinian beef. White faced tree duck, this is my favorite, they are very wary, decoying like a pintail. When they get in range, wait a little longer. They seem to just hang there, making for easy doubles and triples.....if you can pick one out instead of being tempted to flock shoot. Me and Jimmy bearing down on them. Tom Cat, Mobile East and Miss Sharon fishing together, you know they got 'em, this is one of the two that they caught a couple of days ago. As always, expectations have been exceeded. The duck hunting has been incredible the last few days. We hunt ducks in the morning, then again in the afternoon, 2 hunters/blind. Although some pairs of the hunters have had some slow hunts, only shooting a couple dozen, their daily limit was met with some spectacular hunts on the other half of the day. No problem obtaining our daily limit of 50 ducks/person/day. Most of the birds have been "big ducks" such as rosey bills, white faced ducks and one of the 3 species of tree ducks. A few teal, but I like the big ducks. I shot 3 with one shot today and had several "triples" and one "quad". No plugs in the gun are necessary, electronic calls, hunting after sunset. All the stuff that you can't do at home. We just got to Cordoba for the doves and now have internet service. I'll try to get some pics up in the next day or so. All is well here and it looks like the tarpon fishing is happening at home. If I wasn't having such a good time here, I'd be upset that this trip is getting in the way of my tarpon fishing. Sounds like I've got my work cut out for me in order to catch up with some of the other guys......especially you Tom Cat. Huh? Yep, stuck in Chile. Glad that the only thing that we're going to miss is a big steak, bottle of wine and a tango show in Buenos Aires tonight, but I think that I can find 2 out of the 3 here in Santiago. They had a little volcanic ash at the airport this morning when we were supposed to arrive, so we were diverted for a few wonderful hours in Chile while the flight crew recovers, scheduled to arrive in Argentina early in the morning and right on time for the hunting. Bit choppy, but calm enough at times. Saw none, caught none. Spent a lot of time looking when we maybe should have been fishing, but I really wanted to see one. And.......a good time was had by all. Pic and report courtesy of Capt. Gary Dubiel "Striper bite at New Bern was red hot! We had close to 20 fish on top water and were casting at breaking fish for several hours in the morning. With the wind up, we moved up river and added a handful of nice largemouth including 2 fish between 4 and 5 pounds each. 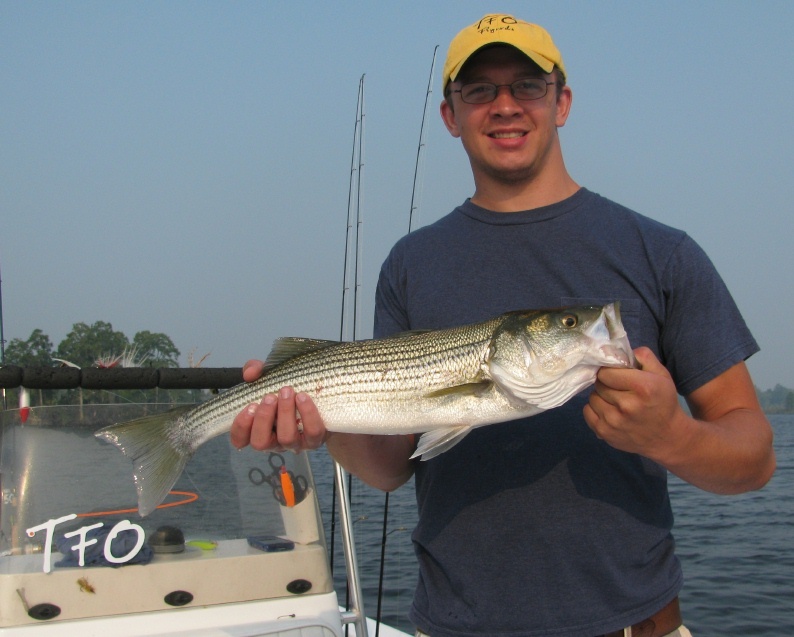 It was Dave and Michelle's first time top water striper fishing!" From Capt. Brian on the Run Off, the dolphin bite was still really good and a lot of little blackfins still showing up. Me? I'm going tarpon fishing for the first time tomorrow.....hell or high water.....I'm going fishing and I don't care that the wind is blowing. 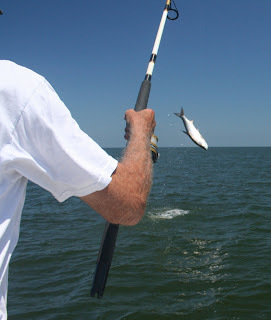 It was a beautiful day on the ocean today and the fishing was really good. Capt. Ray limited out on the groupers, gags, scamps and reds, also 20 dolphin. He was still cleaning fish when I last talked to him. We had a long half day and wore everybody out with the aj's, then finished up with gags and triggers for dinner. I can only imagine what the sound looked like today, tarpon rolling everywhere I'm sure. There's been a lot of that going on and it's killing me not being there......but I had to work today.